Italy is known for being romantic, historical, cultural and expensive. That doesn’t have to be the case, though, and there are plenty of places you can go to soak up the sun in Italy without blowing your budget. First, consider when you want to visit. May, June, September and October are the busiest months in Italy, when the weather is at its finest and the entertainment is in full swing. Choosing a holiday outside of this time can result in much lower prices, although you should avoid the end of August when most Italian’s shut up shop to go on their own holidays. Italy is full of gorgeous cities, and the more flexible you are on where you visit, the better deal you will get. Look at flight websites to see where you can go for the cheapest price, and why not try discount holidays to multiple locations, too. Train travel across Italy can be very cheap, and lets you explore a variety of different towns. Tours are very popular, and often involve flying into one town, travelling through another and flying out of a third. Venice, Florence and Rome tends to be a popular route, with plenty of tickets. Book early for the best rates, or try to swipe a great last minute deal. Accommodation costs can vary significantly between hotels. Look for three or four star hotels with extra night free deals, or children go free deals. Ideally, pick a hotel that includes complimentary breakfast to save yourself spending money. Unusual rooms, such as rooms that share a bathroom, are usually a lot cheaper than standard rooms and are ideal if you are travelling with children or friends. Food prices can be expensive. If you are on a budget, it’s best to avoid restaurants, and instead eat at bars and pizza houses. There are plenty of cheap fillers for snacks, too, such as yummy Italian gelatin which only costs two or three euros. Visiting Italy can be the trip of a lifetime, and doesn’t have to be expensive. Venice and Florence are both beautiful cities that can be visited cheaply, and Rome is an amazing place that can also be done on a budget. Now all you have to do is remember your camera! 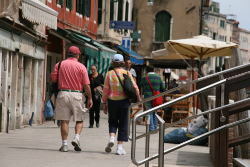 Budget family run hotel situated close to Venice Santa Lucia train station. Overlooking the Grand Canal and close to P.Roma bus station.